Would you like some PS Vita with your Taco????? A while back Sony announced a partnership with famous food chain Taco Bell (similar to Subways Uncharted 3 promotion) the partnership would involve consumers to have a chance at winning a PS Vita every 15 minutes. The PS Vita also inlcudes a 4GB memory card and either ModNation Racers or MLB The Show. And now that contest has officially begun! Check out the promo below! 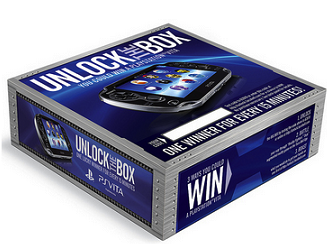 NLOCK THE BOX: Beginning January 26th, Taco Bell’s specially marked $5 Buck Box – which includes a Cheesy Gordita Crunch, Crunchy Taco, Burrito Supreme and medium fountain drink – will also provide a code that can be entered online for an instant chance to “unlock” and win a PS Vita. BATTLE: Download Taco Bell’s new mobile app to check out the exclusively designed Reality Fighters Dojo game where you can “battle” your friends to win a PS Vita. Let us know what you think of the promotion? Is it a waste of money? Would TV ads be much better? What type of advertisements would work best for the PS Vita? Answer in the comments below!